When you think of tightening your belt in crop production, it often means cutting your production costs while maintaining yield to increase profitability. The opposite can be just as effective: Maintaining your production costs while increasing yield will increase profitability. Over the past eight years (2006-2013) the University of Nebraska has conducted 29 trials comparing yields of SCN-resistant and susceptible varieties on fields infested with soybean cyst nematodes. (See 2012-2013 reports online.) The average yield advantage was six bushels per acre. At today's prices, that's an additional $50+ per acre return without investing a dime. SCN-resistant varieties cost no more than susceptible varieties, but yields are significantly higher on infested sites. In short, you can achieve better yields on SCN-infested sites with no increased costs. How do you know if you have an infested site? First, collect soil samples from fields that will be planted to soybeans in 2015. While it may be too late too soil sample this fall, generally fall is a great time to sample fields so you have that information when placing your seed order for next year. However, if you missed your opportunity this fall, you can still sample early next spring in time to change your seed order, if needed. The Nebraska Soybean Board is supporting Nebraska soybean producers by covering the costs of samples submitted to the University of Nebraska for SCN analysis. 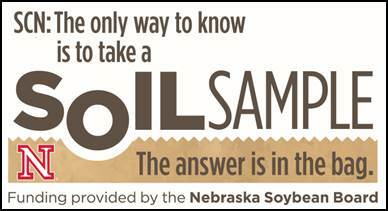 Bags for submitting a sample are available at your local Nebraska Extension office. That's a formula for success any soybean farmer can live with. Think what an increase of $50 per acre on all your soybean acres would do for your bottom line. That's the average return farmers saw by planting SCN-resistant varieties in their SCN-infested fields. Or conversely, if you have SCN in your fields and are not managing it, $50 per acre times all your soybean acres is what you are sacrificing in yields and profitability. For more information on SCN and its management see Soybean Cyst Nematode in the Plant Disease Management section of CropWatch.